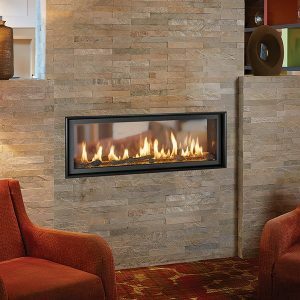 The 4415 HO See-Thru represents Fireplace Xtrordinair’s most transitional and modern linear gas fireplace yet – offering the best in home heating and style, but with double the fire view. This contemporary fireplace features a sleek, linear profile with a long row of dancing flames over a bed of glowing, under-lit crushed glass. The dynamic see-thru design gives you double the amount of fire viewing of this fireplace is perfect for serving as a stylish viewing window between two rooms, or provides a breathtaking display of fire to the center of large rooms and living spaces. The 4415 ST is also an impressive high output heater that features built-in fans which allow you to heat up to 2,100 square feet. The 4415 See-Thru is truly the finest see-thru gas fireplace available, in all areas of construction, quality and safety features. This fireplace is built with superior craftsmanship to extremely high standards at our factory in Mukilteo, Washington. From the heavy duty welded 14-gauge steel fireplace body, to the durable welded frame surrounding the neoceramic glass, you can actually see the level of quality in our materials and workmanship. Installed over the high clarity glass is a nearly invisible 2015 ANSI-compliant safety screen.